The humble sandwich. It's a staple, but is it ever exciting? Our answer: YES, ABSOLUTELY. Cut through the pallid baps and dry baguettes to reach the satisfyingly filling centres of the superior sandwiches residing within London's W postcodes. This ever-popular, Latin-named restaurant roughly translates as "where are you going?". The answer to which is always "to your tiny and delicious smoked eel sandwiches of course!" More of a snack than a full-blown sandwich, this dinky offering is a rich, juicy triumph of flavour balance. The smokiness of the eel, the gentle heat of the horseradish, the tartness of the pickled onion - it's a moreish morsel that is best ordered on a full stomach, otherwise your wallet's in trouble. Our sandwich loyalty to Mr Falafel is unwavering. In the past we've even said "we defy you not to make a place for this Palestinian caff on any 'best sandwich' list" - and who are we to disobey our own musings?! Be warned: go once and you'll be coming back again and again. Their variety of falafel wraps are generously portioned and unfailingly fresh. We especially love 'The Deluxe' with its addition of crispy caulifower and potato. Lots of vegan options, too. Don't make the mistake of passing this inconspicious spot on Edgware Road by. The queue that often snakes out the door is a telling sign that there are serious goodies to be found within, and they come in the form of perfectly spiced, grilled-to-perfection, off-the-spit lamb shawarma. Juicy, flavourful and lovingly wrapped up with pickles and vegetables, it is more than worth the wait. A beautiful Japanese bakery just around the corner from South Ealing's tube station, pay Tetote Factory a visit for its glorious breads and range of stuffed buns, otherwise known as 'pan'. Super-fluffy with a variety of savoury fillings, they are freshly-made on the day and once they're gone - that's it. Our recommendation? Get there early for the best choice, grab your pan and revel in total smugness as your devour it slowly. Then come back the next day to do it all over again. Sandwich lovers have one clear choice upon arrival at this Covent Garden wine bar: the Posh Madame. It's essentially a truffle-laced toastie and we can't get enough of it. Upon fluffy sourdough bread sits a heady mix of oozy bechamel, truffled ham and a dinky fried quail's egg. Elegant and so delicious that we don't even feel bad for eating it alongside a glass of wine. Their website claims they are in pursuit of the 'Danish good life' and with sandwiches this tasty, we'd argue the chase is paying off. Their Smorrebrod (otherwise known as open-sandwiches) are freshly made with an ever-changing daily selection. Snap up the authentic herring topping if it's available during your visit, but the smoked salmon and egg choices are similarly satisfying. It's all clean, bright and light with superb flavours. There are a lot of top sandwiches on offer at this Japanese patisserie cafe, but the one you want is the egg mayo bun. Upon its arrival you may wonder what on earth this cornflake-coated orb of oddness is, but stick with it. These crispy flakes give way to a lightly curry-flavoured bun, soft and doughy, which in turn encompasses a rich centre of creamy, yolk-heavy egg mayo. It's sort of a savoury doughnut and any qualms will soon evaporate upon eating. It's delicious. As the name might suggest, egg is always the plat du jour at Eggbreak. Luckily for us all, eggs and sandwiches are a match made in heaven and their version of the McMuffin (not quite sure how they're getting away with that) is a breakfast sarnie triumph. Sausage patty, American cheese, fried egg, hot sauce and toasted muffin - we're lovin' it. 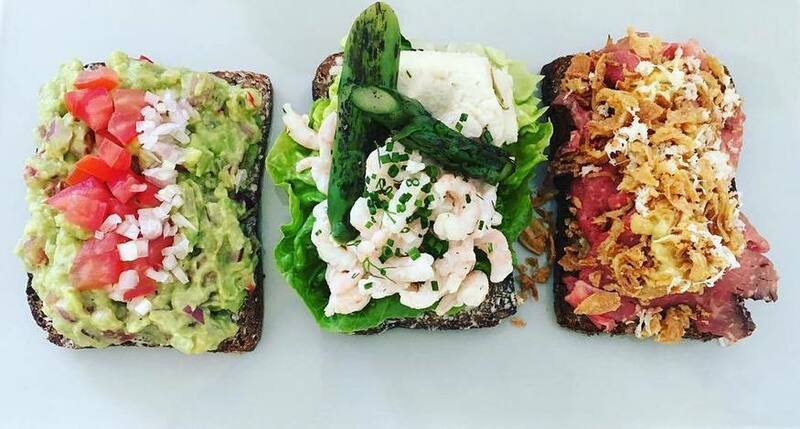 This Scandinavian café is the place to get serious about your sandwiches. Founded by friends Dominic Hamdby and Oliver Hiam after a trip to Copenhagen, the focus is on simple, fresh flavours and top-quality ingredients. The quality speaks for itself when it comes to their ever-rotating trio of toasties, which sit piled-high behind the perspex counter, ready for the toasting. On our visit we opted for the beer-braised onion, kale and cheddar toastie and we now keep an eye permanently peeled for it whenever we're passing.